New Imagery in Google Earth October 07. Again. Crossing the Sacramento River in Redding, California is the sundial bridge which (as you might have guessed) serves the dual purpose of being both a bridge and a sundial! I previously tried to use North America’s largest sundial to tell the time on Google Earth, which was much more effort than I’d anticipated, and not an exercise I’m keen to repeat. However, according to “Sundial 101“, telling the time on the sundial bridge should be easier, as “the base plate is titled at an angle equal to the latitude, and the style is perpendicular to the base, which will align it with the earth’s axis”. Which apparently means that the time can be simply read from the equally spaced markers to the North of the bridge. Each marker represents an hour from 10am until 3pm (I guess that outside these times you’ll just have to look at your watch). Therefore, I’d say that this photograph was taken at approximately 11.30am! The sundial bridge was designed by renowned Spanish architect Santiago Calatrava whose work always looks great from above. We’ve previously featured his Saint-Exupéry TGV Terminal and Montjuic Communications Tower. Calatrava’s design for the World Trade Center Transportation Hub in NYC is currently under construction and is expected to be completed by 2008. More info on the bridge from Tutle Bay Exploration Park and CNet News and you may also enjoy Felippo’s extensive sundial collection. The surface of this bridge is frosted glass, which looks nice, but gets extremely hot in the sun. Too hot for dogs or barefooted people to cross. They have cheesy signs up warning people about this danger. It as been a couple years since I’ve been ther so maybe they have found a solution or at least better signage. As a Swede I must also point you towards what is the hightest Skyscraper in Sweden, the Turning Torso. A stunning buildning in the third largest city of Sweden, Malmoe. This building is also designed by Santiago Calatrava. 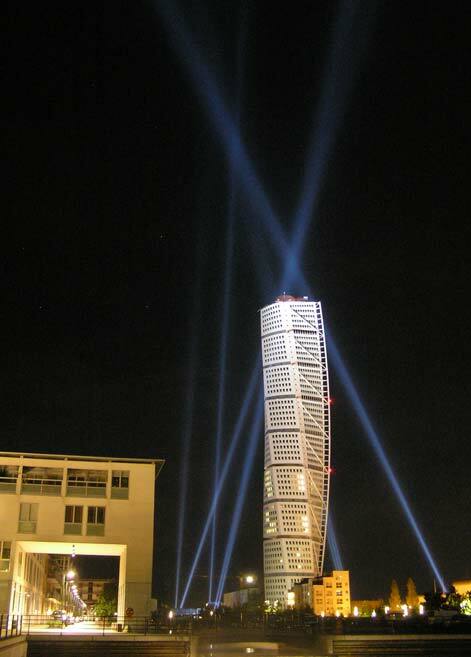 A visit to the Turning Torsos official website will show you this magnificent building, http://www.turningtorso.com . If you visit that site, be sure to use the 360 degree panoramic view found in the menu on the left. If you do so, be sure to look directly to the south. By doing so you will see a pier close by. A couple of hundred meters inland you will find the neighbourhood in which the Swedeish footballstar, that would be soccer for you americans, Zlatan Ibrahimovic recently purchased a villa for the amount of about 3 Million Euros (4.2 Million US Dollars). Here are a couple of pictures of the Turning Torso and of course the link on Google. On Google Maps you will see that the buildning is not yet completed although it was campleted by August 2005. Here’s a picture I took of the bridge, it was pretty cool.